The fashion capital hosted the female cycling movement on September 23rd. Since the 16th century, Milan has been regarded as the Fashion Capital of the World. Milan has been the design capital of Italy since the beginning of the 20th century when the city led the way in industrial design. The city of Milan would love to be the book, music, film capital of the world as well. During the Piano Week, pianos invade houses, yards, stations, roofs, farmsteads, museums, schools, libraries, laboratories and parks, on trams and on boats across Milan. Same thing happens during the Book Week etc. Milano staged a collection of events, workshops, and bike rides dedicated to bicycle culture from 15th until the 30th of September. During the Milano Bike City, a very special event took place: The international women-only cycling event “Fancy Women Bike Ride”. 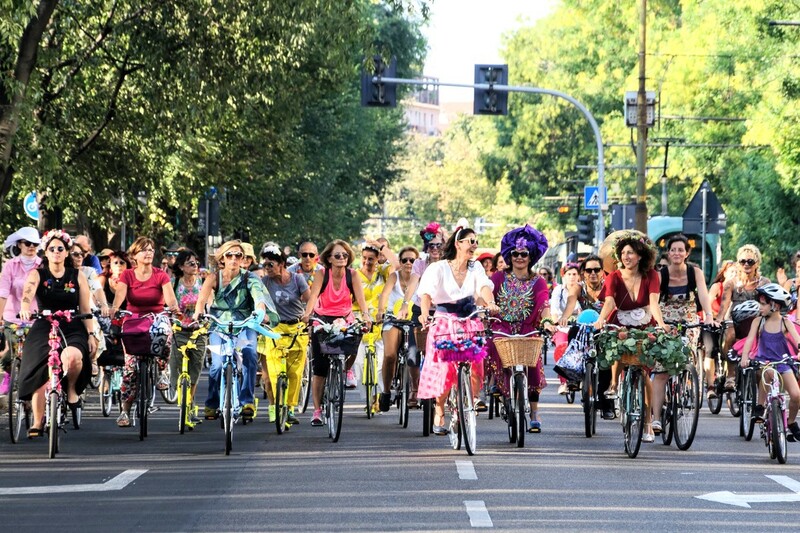 Since 2013, Fancy Women Bike Ride has been committed to spread this message in cities across Europe, bringing women together to ride with a fancy look. The idea for these events began in Izmir, Turkey. Every year, Fancy Women Bike Ride is held on World Car Free Day in destinations all over Europe. This year, rides were undertaken in Cologne, Germany; Bern, Switzerland and Milan, Italy. The movement is increasingly gaining traction in various circles. We’ve been contacted by volunteering women from many more cities and Fancy Women Bike Ride is set to be in all the continents by the next year.